Ponytail palm is a slow growing palm tree featuring a very wide base that can reach several feet in diameter. The top of the trunk tapers where branches of medium, thin strands of bright green fronds grow in a hair-like manner; cascading in mounds out of the top of the trunk. Once the tree matures, typically after about ten years, expect a large white cluster of flowers to emerge from the tip each summer. While referred to as a palm, this plant is actually actually a distant relative of true palms. Pony tail palms can withstand temperatures down to 32 F, but can be damaged or killed at lower temperatures. Plants are low-maintenance once established. While plants can tolerate a variety of light conditions, avoid a western sun exposure. 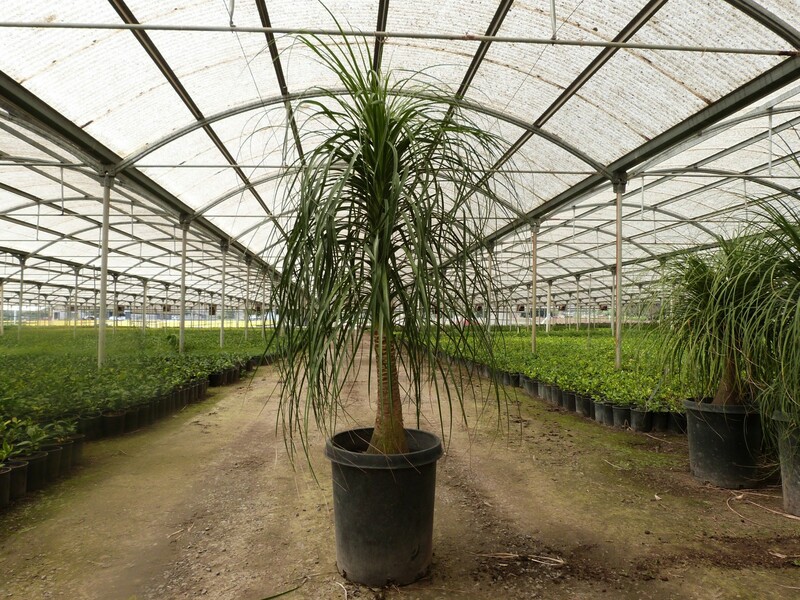 Ponytail palm grows very well indoors in containers or interior landscapes where they will need bright indirect light to thrive. In fact, plants are more often used indoors and considered an unusual outdoor specimen. Plants will need some supplemental water but take care not to overwater.